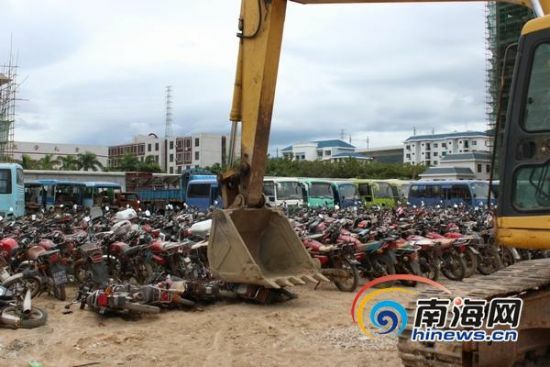 The Sanya Public Security Bureau Traffic Police destroyed 4296 scrapped motor vehicles in the morning of 12th January, 2012. The vice-captain of the Sanya Traffic Police Detachment Lu Richao, said that the aim of the destruction was to clear potential accidents from the source and to clarify the environment on the road. According to the Sanya Public Security Bureau, they have launched special campaign of traffic violations among motorcars and electric bicycles since December last year. As the statistics revealed, they issues altogether 5630 traffic violations, and detained 2777 motorcars and electric bicycles since the campaign.